Electricity and complexity of electrical work should not be underestimated. By doing so, not only could you harm yourself or someone in your family, but something as simple as a pinched wire or loose connection can lead to a fire that burns your house down. At RI Electrical, we have noticed that the average person is unaware of the safety measures and precautions that need to be taken while working with electricity, and this lack of knowledge can lead to several mistakes. 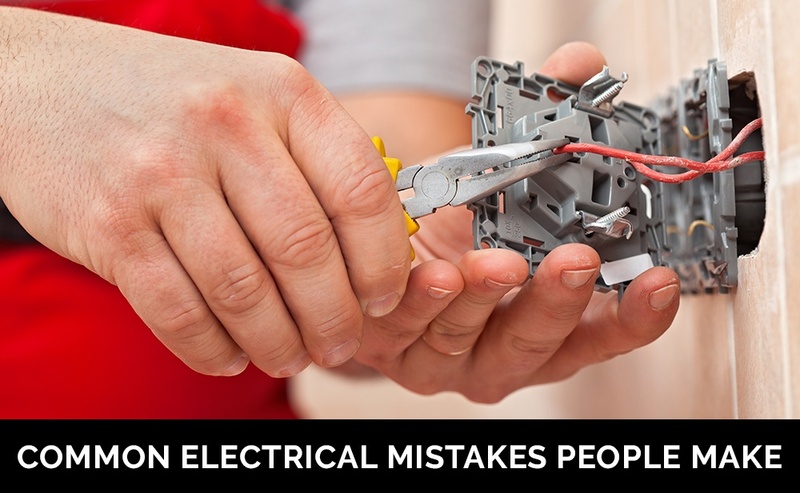 As experts in the field, we want to help you steer clear of these errors, and to help you do so, we have compiled a list of the most common electrical mistakes people make. 1. Hiring an unqualified worker. We encounter so many scenarios where it’s clear the last person working in the home has no proper electrical training. For instance, we commonly find splices/connections made without using an electrical junction box. This is a shock hazard as well as a fire hazard especially when they are done in attics with insulation. We almost always see circuits that have been overloaded or tied into other circuits that shouldn’t be shared with anything. An example is people putting their fridge circuit on with a dishwasher. The issue with that is if both are running at the same time you have the potential for the breaker to trip and you may not notice right away and possibly ruin your food. 2. Ignoring the “IC” rating for pot lights. So many people are putting pot lights in their homes because they provide excellent light and look nice, as well. One thing to keep in mind when installing pot lights is that they need to have an “IC” rating. This means that they are approved for direct contact with insulation if they are going to be installed in an insulated ceiling. If this is ignored, then you have a fire hazard as the heat generated from the lights will not be dissipated as quickly because of the insulation. 3. Incorrectly wiring a three-way switch. A properly wired three-way switch can be turned on and off from either location. There are countless times I get called to a home because someone has wired a switch incorrectly and requires someone to go downstairs in the dark in order to turn on the switch at the bottom of the stairs. 4. Not following the electrical code. Often, we see a lot of wiring in panels that is against electrical code. The current flowing through wires creates heat in the wire so by increasing the current passing through it, the chances are it will heat up and eventually create fire. Breakers are used to limit the current through a wire, but uncertified workers use oversized breakers as a solution to the problem of nuisance tripping. The proper solution is to either run a new circuit that is bigger or take some of the devices off that circuit and relocate them to another. An electrical error can wreak havoc in a home. By being aware of common electrical mistakes, and knowing how to avoid them may not only reduce safety risks but also save you time and money. For qualified and reliable electrical work, reach out to the experts at RI Electrical. As experienced electrical contractors in Kamloops, BC, we provide residential, commercial, industrial and solar electrical work. We also specialize in maintenance, renovations, and new constructions, and are available at any time of any day to provide the best electrical services to our customers. For a complete list of services, please click here. If you have any questions about electrical work, we’d love to hear from you. Please contact us here.